Residents pack the Center of Light Church in Lancaster for a chance to speak with attorneys and investigators from the US Department of Justice. 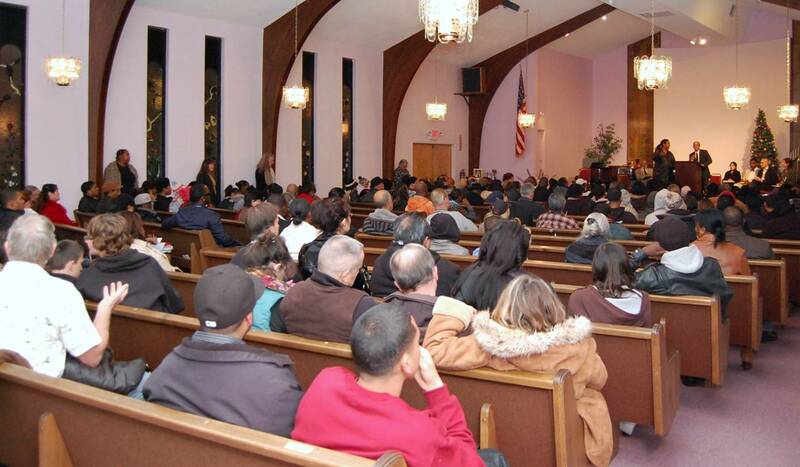 LANCASTER –More than 200 residents converged at the Center of Light Church in Lancaster Tuesday night for a chance to speak directly with investigators and attorneys from the U.S. Department of Justice. Justice Department lawyer, Charles Hart, addresses the crowd Tuesday night. 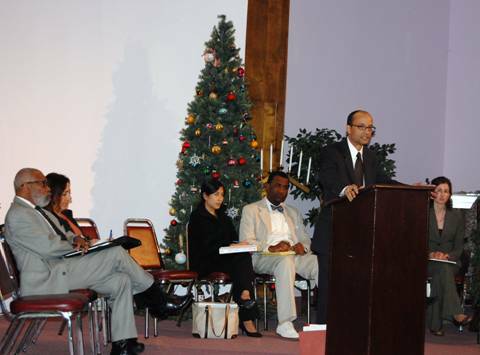 The public meeting was hosted by The Community Action League (TCAL) as a means for the Justice Department to take direct testimony from residents for the federal investigation into alleged discriminatory policing by the Los Angeles County Sheriff’s Lancaster and Palmdale stations, as well as the separate investigation into alleged harassment and mistreatment of Section 8 recipients in the Antelope Valley. The Justice Department announced its investigation in August (read it here), two months after the Public Counsel Law Center, on behalf of the NAACP and TCAL, filed a federal lawsuit against the cities of Lancaster and Palmdale. The lawsuit claims black and Latino families using Section 8 are victims of constant, unbearable harassment at the hands of housing authority investigators, sheriff’s deputies and local politicians. Read more here. He said investigators would document residents’ stories at the meeting and then follow up by researching the cases. He could not give a timeline for the investigation, but said it would be moving quickly and his department would be thorough. An investigator from the U.S. Department of Housing and Urban Development was also on hand to take testimony from residents. Catherine Ross-Perry, from HUD’s San Francisco office, said she was investigating complaints that involved targeted discrimination against people using Section 8 housing vouchers. The DOJ meeting lasted about two and a half hours, according to organizers. Residents were asked to form lines, based on the nature of their complaints. Residents who had complaints involving Section 8, met privately with investigators and attorneys in one room, while residents with complaints involving Lancaster and Palmdale Sheriff’s deputies, met privately with investigators and attorneys in another room. TCAL Board Member, Pharoah Mitchell, said the meeting lasted about two and a half hours. He said federal representatives were able to talk to every resident who had a story to share. 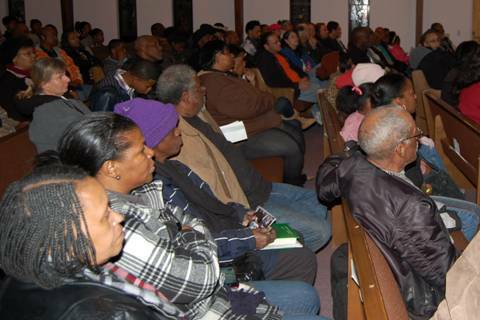 At Tuesday’s meeting, federal investigators also gave out contact information for residents who were not able to attend the meeting, but still wished to have their complaints documented. Those residents can contact 877-218-5228 or email community.antelope@usdoj.gov. 3 comments for "DOJ attorneys, investigators hear from AV residents"
Didn’t read the article did ya sick? Read this article, and one realizes the DOJ might be years behind in their investigations. And wonder just how many victims there are out there. It certainly explains the bald head “skin head” appearances many, if not most of our deputies have adapted since the early 90’s. How F—king STUPID are you???? The Sheriff deputies wear short hair because it is easy to maintain, because it cannot be grabbed or pulled and because they HAVE THE RIGHT to wear their hair any way they want to. Here we go with another of your b.s. anti-cop rants. Tell you what, “jo”, you put on a uniform and you go out and deal with the scum of the earth every single day and then let me tell you what I think about your hair. Go “occupy” Sierra Hwy again, you dumb ‘tard!